A glorious wagon roof coloured in blue, crimson and gold runs the entire length of the church covering the nave and chancel, there being no chancel arch. 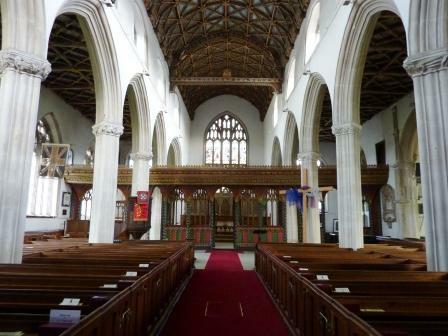 It consists of four main bays covering both Nave and Chancel, there being no chancel arch. Each bay is included between four-centred arched principals – that is an arch composed of two pairs of arcs of different radii, these being elaborately carved and pierced with quatrefoils, with a pendant boss at the apex of the roof. These main bays are subdivided by moulded secondary ribs and purlins into a total of twenty four bays and 144 panels and each panel is braced saltire wise, with a carved boss at every intersection, and each having a carved leaf-cresting highlighted by the panel colouring remaining from the original blue and red with which the whole roof was once ablaze. The whole structure rests on corbed brackets with standing angels and a wall plate with its cornice carved with vine-trail decoration over its entire length. The Chancel roof section was recoloured and gilded in 1859, when iron tie rods were inserted by William Froude, a Great Western Railway engineer under I K Brunel who thought that vibration from the railway in the valley would adversely affect the structure. This consists of eleven bays, three for each isle with a central door and five in the Nave also, with central door. The tracery in the bays closely follows the pattern of the windows in the aisles, and the fan tracery of the coving with its ornamental bosses supports a beautifully carved cornice of three orders of vine trails, surrounded by an exquisite cresting behind which is a beam carrying a series of mortices which once carried an additional part of the screen, perhaps a parapet, now vanished. The colouring on the east side is the original, but the west side was recoloured in 1849 at the same time as the chancel roof. This is made of oak and, like the wall-plate cornice of the roof, is carved and pierced with vine-trail ornament and cresting. It also has curved ends terminating downward with half-figures; a boy at the north end, and a girl at the south end, gazing down at the now vanished figures of the rood. The original iron support staple for the rood can be seen at the rear of the beam, and the Royal Arms at the centre of the beam are those of Queen Victoria. The chancel was pulled down and rebuilt on Froude’s recommendation around 1839. The roof was repaired and recoloured green replacing the blue after damage during a storm. Here, the Victorian Reredos of of Caen stone. On the north side of the chancel is Moore’s Chantry or Moorehayes Chapel. On the floor are many interesting old tomb inscriptions; one is dated 1471. 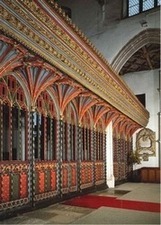 The Rood Screen is one of the longest in Devon, it consists of eleven bays, three for each aisle and five in the nave. It also has a central door. The colouring on the east side is original but the west side was recoloured in 1849 at the same time as the chancel roof. On top of the screen over the central door, once stood the Golgotha, which now rests at west end of Lane’s Aisle. The Jacobean Gallery was erected in 1637 and is one of the longest in Devon. Along the front are sixteen figures, looking rather like Guy Fawkes, but actually representing the four evangelists and the twelve apostles, with St Andrew in the middle. Above the gallery is the priest’s squint which enabled the priest to keep an eye on his church from his chamber. The first major addition to the church was Lane’s Aisle, which was built between 1526 and 1529. It is well known for its elaborate fan vaulting . 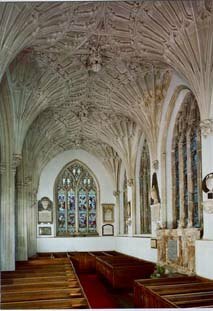 John Lane was a clothier of Cullompton and built it as his Chantry Chapel. With it’s heavy fan vaulting the aisle is reminiscent of the Dorset Aisle at Ottery St Mary or John Greenway’s chapel at St Peter’s, Tiverton. At the west end is the Golgotha which once stood on the Rood Screen (see picture). A curious feature of Lane’s Aisle is that the fan vaulting does not fit the windows and external buttresses, making it possible that a mistake in the original plan was made. There is also a War Memorial in alabaster to the men of Cullompton who died in the 1914-18 war. Lane’s Aisle was possibly one of the last Chantries to be built before the Reformation brought an end to the building of such chapels, and it should be noted that John Lane did not see the completion of his work when he died in 1528. Lane and his wife were buried inside at the east end of the aisle. Cullompton Church is unique throughout England, and possibly throughout Christendom, in possessing to the present day the original carved wooden base of the medieval rood. It is sometimes called the “Golgotha” because it is carved with skulls and rocks and crossbones. During the Middle Ages, it was a common practice to erect a carved representation of the crucifixion scene at Golgotha above the stone or wooden screen, which divided the chancel from the nave in most ancient churches. 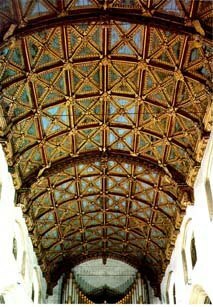 Hence the screen became known as the rood screen, because the carved figures above it were called the ‘rood’. 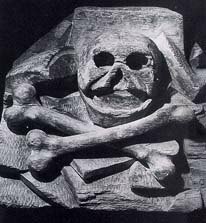 It consists of two massive baulks of oak carved in the fashion of rocks with skulls and bones and carrying the socket for the cross. It also has two platforms for the figures of Mary and John, forming the base of the ancient rood. From its size and commanding position this carving would have been regarded as symbolic and full of meaning. All who passed from the nave into the sanctuary for communion would have passed ‘under the cross’. How the Golgotha at St Andrew’s escaped destruction during the Protestant Reformation is unknown. It is a matchless representation of medieval craftsmanship. The wood is now so hardened and worn by age that it has the appearance of stone. It is 17 feet in length and one foot nine inches in diameter and of enormous weight. It is at least 500 years old and is thought to be the only remaining one in the country and possibly the world. It is a unique survival of the Reformation. It now stands at the back of Lane’s Aisle. The great west tower was added in 1545-1549. From the ground to the parapet it measures 100 feet, and the pinnacles are nearly 20 feet higher. The tower is built from local stone with enrichments of Beer and Ham stone. The uppermost section is the belfry which is lit by four windows of Beer Stone in each face. There is a ring of ten bells augmented from eight after the 1914-18 war. The clock face is set on the third section and is framed in a stone frame with crocketed pinnacles. The church tower was refurbished in 1999/2000. St Andrew’s Church Cullompton is a Grade 1* listed building and is rated among the top 1000 Churches in Britain. It is a significant jewel in Cullompton’s heritage crown. It is also a valuable asset to the Church of England and the outworking of the Christian faith in Cullompton: revealing the heart of Jesus in the heart of our community. It is an asset to be treasured by all and, at 600 years old, is constantly in need of, often very expensive, care and repair. The Church of England has a 5 yearly cycle of inspection and assessment of Church buildings fabric through an architectural inspection process called the Quinquennial.Since the last inspection of St Andrew’s 3 years ago we have been planning some priority repair/restoration work primarily to the stone window frames including the high Clerestory windows. The cost of all these works was estimated at around £250K. In order to fund this we applied to the Heritage Lottery Fund for the major part of the money required. We were successful and were awarded approximately half of the cost from Heritage Lottery funds. Major restoration works which started on July 2015 and completed in December 2015.